The Tampa Bay Times did not provide a link to the All for Transportation (AFT) 5 page charter amendment so they were not compelled to refer to actual language in the tax hike document. 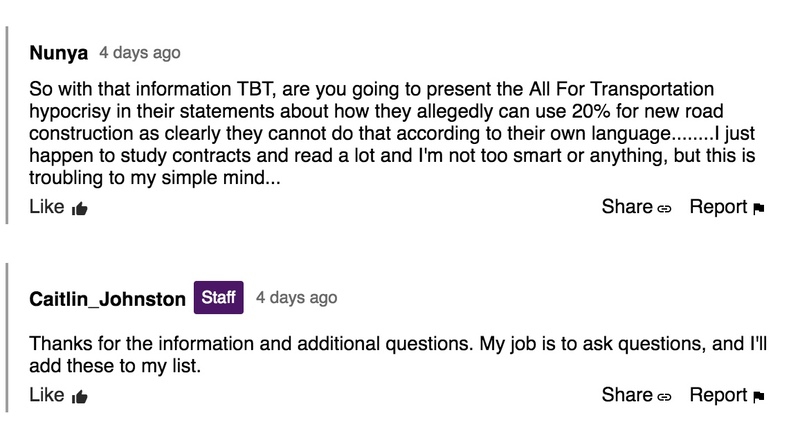 This allowed the Times to run with AFT claims with no evidence to back them up and no questions asked. If one reads the entire (AFT) tax hike charter amendment, it tells them how AFT, who is accountable to no voter or taxpayer, appropriated the sales tax proceeds. AFT's amendment does not only enact the 1% transportation tax but specifically mandates how AFT decided where and how $16 Billion of sales tax proceeds must be spent for 30 years. Missing in AFT's tax hike amendment is funding for new road capacity. AFT does not appropriate one penny of the $16 Billion tax proceeds for new road capacity - for 30 years. 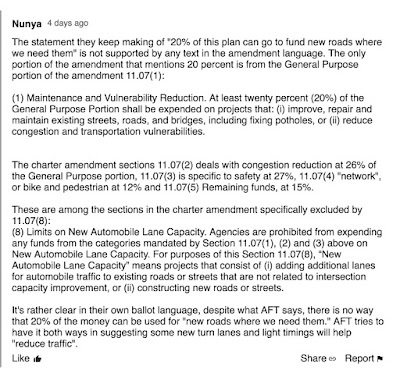 The only time AFT mentions new automobile lane capacity is to prohibit funding it. We raised the red flag about misleading and deceptive language used by AFT and the "no new road funding" issue from the start of AFT's petition drive last June. Commissioner White cited the issues in his public statement he made on October 18th prior to the election. After formal opposition to AFT's tax hike was launched in October, AFT realized they could no longer hide from the language used in their tax hike amendment. Weeks before the election, AFT was forced to admit they did not appropriate any dedicated funding for new road capacity. 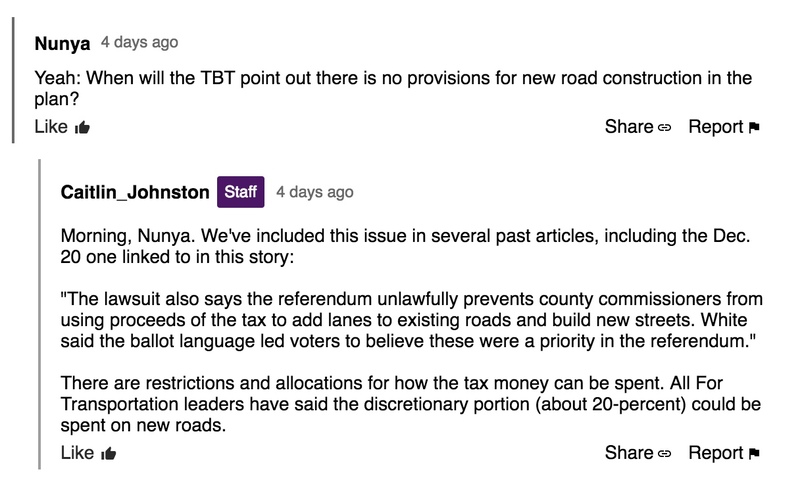 AFT then tried to obfuscate the issue by suddenly claiming some 20% of funding somewhere "could" be used to fund new roads. The Times ran with AFT's claims with no evidence to back them up. But simple math simply does not add up to support AFT's claim and "could" means there is a possibility, no guarantees just a maybe or perhaps. A breakdown of AFT's spending appropriations is here and here. 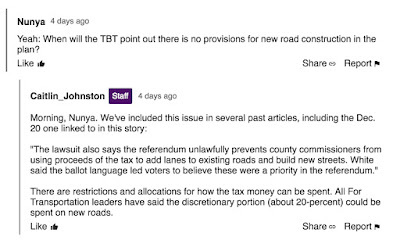 In a January 14th article, Uncertainty over lawsuit puts Hillsborough’s transportation plans on ice, Times reporter Caitlin Johnston decided to jump into the comments of her own article. Johnston confirms how the Times relied on and advanced AFT talking points that are nowhere to be found in the actual language of AFT's 5 page charter amendment. The words "can", "could" or "discretionary" are nowhere to be found in AFT's charter amendment. AFT can just make stuff up and the Times runs with it. 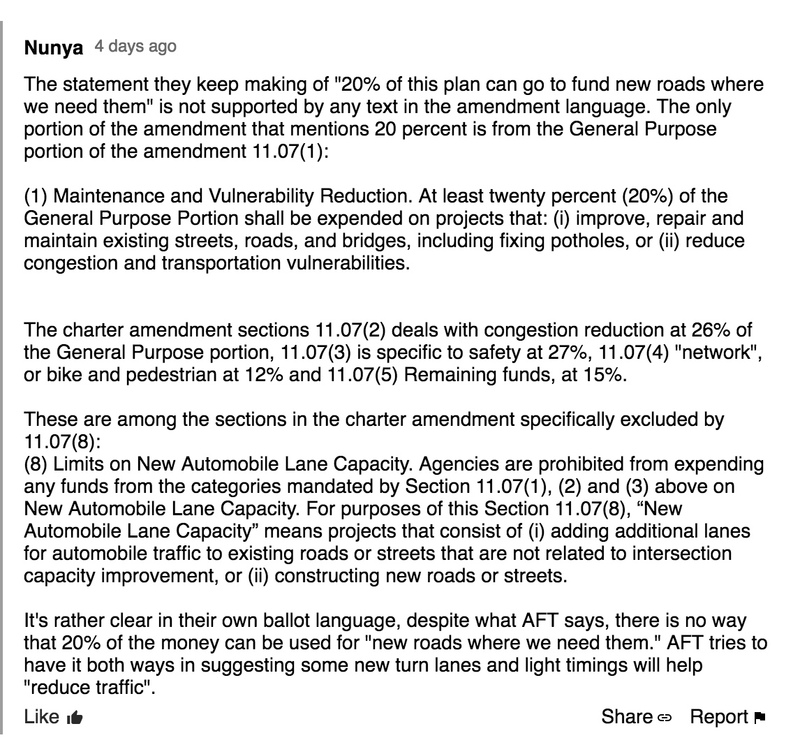 Commenter Nunya above cites specific language straight from the charter amendment which we and others cited over and over that reflects AFT's 20% claim is not true. Astoundingly, Johnston responds as if she never read the charter amendment and the actual language in it is new information to her. How can that be? The Times has been reporting about the AFT transit tax since the petition drive began June 15, 2018. Where's Politifact? Why aren't they fact checking the Times and AFT? The role of media is to ask question, as Johnston admits in her comment that is her job. But questions about an important election issue, a 30 year $16 Billion tax hike, must be asked when they are most relevant - before the election. The Times failed miserably to do their journalistic job. The Times violated the very Principles of Journalism. The financially distressed Times cannot "ruffle the feathers" of the financial benefactors who bailed them out in 2017. Those financial benefactors include Jeff Vinik, Frank Morsani and Darryl Shaw who became major financial donors to AFT's tax hike campaign. Vinik and entities he owns has contributed almost 25% of the $4 million AFT has raised to date. In 2017 the Times understood appropriations authority is vested with duly elected county commissioners, which is correct according to FS 212.055. Therefore, the failure of the Times to inform the voting public of such critical information in 2018 had to be intentional. AFT, the Times and their financial benefactors decided to attempt an end round the appropriations authority statutorily vested in duly elected county commissioners with AFT's tax hike charter amendment. The Times relinquished their media role as independent and neutral watchdogs to become the protectors and promoters for the agenda of their wealthy financial benefactors. How about no new roads until we fix what we have Sharon? You continue to clap for the TBX toll lanes and that's all you want. Nothing else.